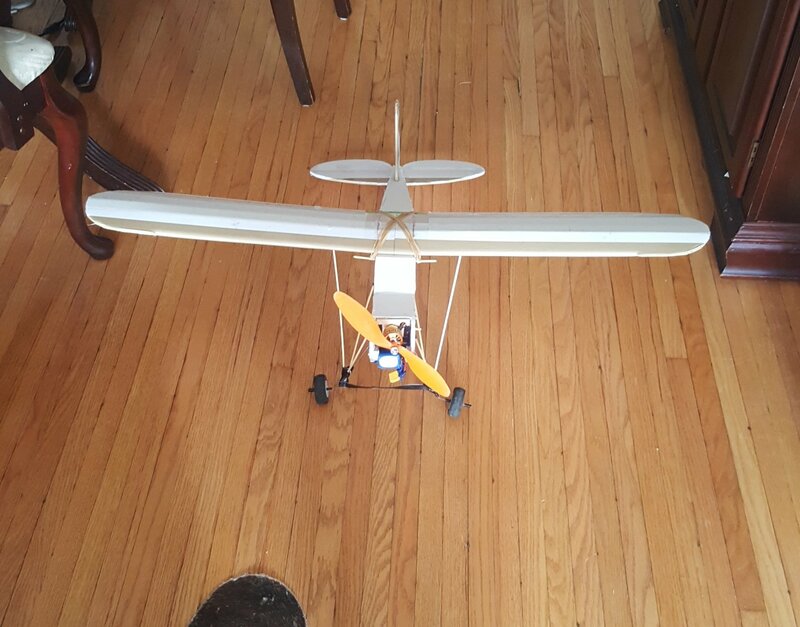 I recently scratch built a FT Pietenpol, and love it! I run a Park280 with a 6x4- 6x5.5 prop, and was getting 10-12minute flights out of 1350mAh batteries. I accumulated about 1h20 of flight time before getting a bit too big for my breeches and taking her up on WAY too windy of a day, and cartwheeling it pretty good. It would be more effort to get the repairs completed on the Piet, than it would be to finish an FT Cub I had started and stalled out on. All it needed were electronics and control arms. 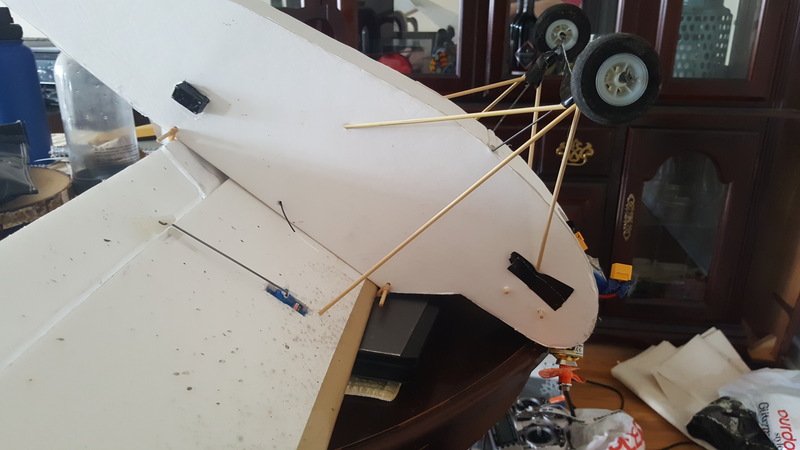 Knowing my skill level, I had started to build this cub out of DTFB, quickly, paying little mind to the stick count of hot glue, in order to get a plane in the air and start to learn the model and knock some serious rust of some skills. I didn't have an appropriate motor at the time, so progress ground to a halt. I had started playing more with using foam glue aft of CofG by the time I would get back to it. I got my hands on a rimfire 400...and was appropriately motivated. So I slapped her together and was pleased as Little Jack Horner when it was done. Then I put her on the scale (terrible thing to do to a lady)...never mind pleasantly plump, she is a tubby one for sure. 3s 1600mAh, Rimfire 400, 10x4.7sf, with an AUW pushing 680g! Good thing she's got the biģ power plant to go with it. 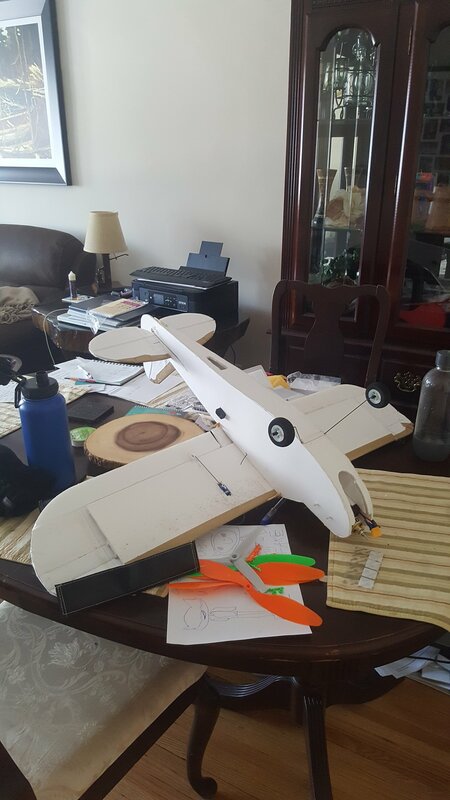 I had cut the ailerons into the wing already, with the intention of putting them in and trimming them for when I was good and comfortable flying it 3 channel. Her extra weight had me nervous about her "rotate" speed. This spurred me to figure how to add flaperons on my radio. I told myself I could be strong, and not use them until I had the rest of the basics dialed in (yeah, right). Not quite having the courage of my convictions towards just hand launching her, I really wanted landing gear to be able to do ground runs and work my way up. She wants to fly! The ground runs up my street, and first couple ground effect flights were pleasantly surprising. Very glad I programmed the reduced rates! I think it would have been uncontrollable otherwise. Having never played with flaperons before, of course i had to. They definitely had an effect, and I was thrilled that they didn't introduce any particular weirdness during my run-ups. The only other thing I had to iron out before getting to some proper flight testing, was the landing gear. She's a bigger lady, so the meager wire I bent for basic wheeling action was completely failing to live up to the task at hand. You know the feeling in an older, heavy car (possibly with bench seats, wood grain panelling, and about 6ft of hood) when the suspension is blown (and it truly becomes a land yacht on wavy waters)...you get the picture. Flight testing next. 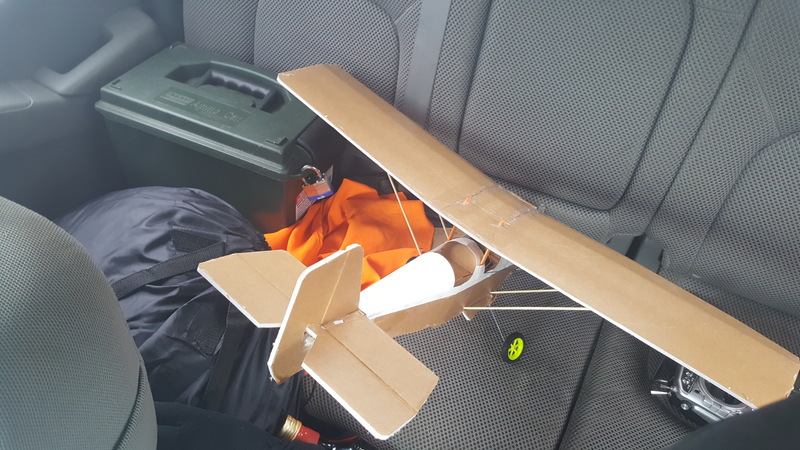 Along with learning more about working with my Taranis x9d, I built this cub to learn on and crash, so I can more confidently put some proper time and effort into making one to fly amphib this summer. It has been a blast so far. I'll let you know how it goes 😉. Good luck with the maiden . It looks (in the last picture) as if you have a little left thrust angle, not a good thing for a ccw motor, might just be an optical illusion though. Nice build . Was nice reading through your experience I’ll be watching this thread to see how things worked out for you. Good luck! Paracodespoder, good eye! I had the motor unmounted to open up a bit more wood so my mounting screws had more than 1.5 threads of purchase. It was slapped back into "position" for the close up photo op. 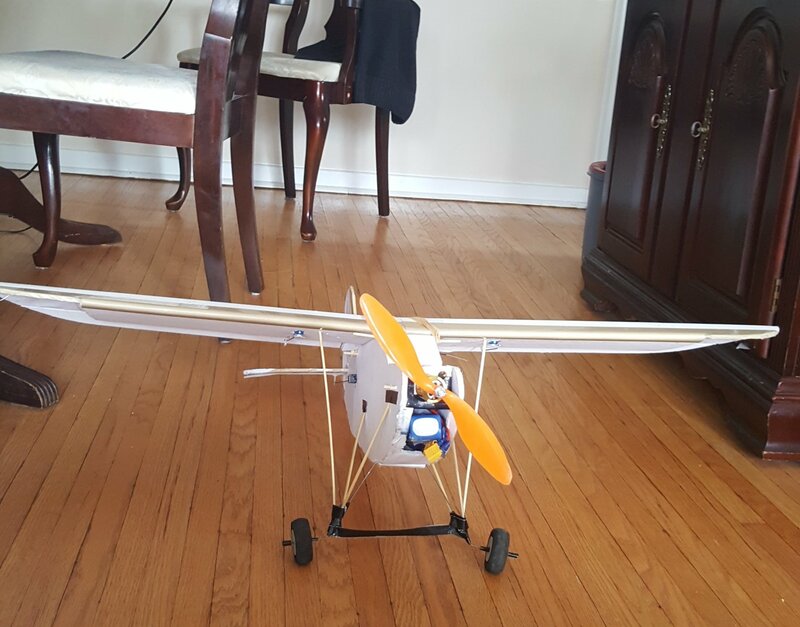 Well, with winds 13km/hr gusting 20, flaps in first position, and a full 1600mAh 3s, she made her proper maiden to much fanfare and celebration (mostly in my head). Like I said, she wants to fly! Ailerons are a little anemic against heavier gusts to begin with, flaps 1 had me at walking speed maintaining altitude against the wind, flaps 2 almost had me flying backwards in the strongest tonight's steady winds. She's got power enough to climb me out nearly vertically in a pinch (never you mind how I figured that out 😉). 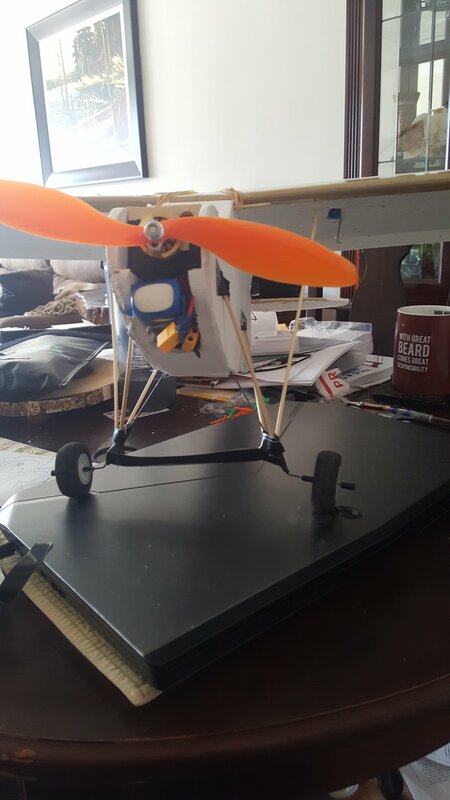 May look into a 9x5 prop to help stretch the flight times, 10ish minutes for a 1600mAh. It would still likely loop nicely, and still have some jam left for emergencies. Otherwise, I may have to throw a couple 5g servos on it for bomb drops when I get back from work next month. Oh, right, my jenky wheel struts worked a treat; they will hereby remain a feature of this aircraft. I'll have to drag my wife out next time to get some flight photos for me(us). Oh, right, my jenky wheel struts worked a treat; they will hereby remain a feature of this aircraft. Glad your tubby cubby flew great, I’ve had great flying cubs and some not so much... mostly my fault I’m sure. Yes, video next time is a must! Be very careful asking your wife to go,, DO NOT used the words "chubby" or "tubby" at any time!